Three Melodramas by Yasujiro Ozu is the latest addition to the BFI's DVD strand The Ozu Collection. Melodrama is a word rarely associated with the work of the master Japanese director, whose beautifully constructed films capture the poetry of everyday life. Spanning his career, these three films, Early Spring (1956), Tokyo Twilight (1957) and the rare silent Woman of Tokyo (1933), demonstrate the director's ability to apply his exquisite style to darker themes. Ozu's silent Woman of Tokyo sees the director experimenting with the cutaways that were to become so associated with his later style. Chikako (Yoshiko Okada) works hard to pay for her brother Ryoichi's (Ureo Egawa) college fees. When Ryoichi learns the true nature of this work disaster ensues. This tragic tale of misunderstood sacrifice features a new score by Ed Hughes. Made just after his celebrated Tokyo Story, Ozu's Early Spring tackles the problems of young salaried workers. Shoji (Ryu Ikebe) and his wife Masako, played by the multitalented Chikage Awashima (Late Spring), struggle to come to terms with a family tragedy. When the office flirt 'Goldfish' (Keiko Kishi) starts to interest Shoji, the couple's fragile peace is severely threatened. Abandoned by their mother when they were young, sisters Akiko (Ineko Arima) and Takako (Setsuko Hara) live with their father Shukichi (played by Ozu's favourite actor Chishu Ryu). Each nurses her own personal sorrow but when Akiko falls into desperate trouble she turns away from her family. Ozu's last film in black and white, Tokyo Twilight is a masterpiece of atmospheric chiaroscuro. 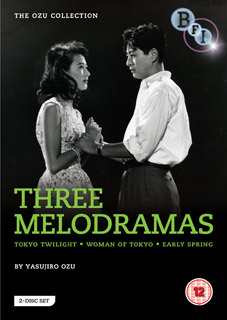 Three Melodramas by Yasujiro Ozu will be released on DVD in the UK by the BFI on 18th June 2012 at the RRP of £29.99. Illustrated booklet including a newly commissioned essay from Asian cinema expert Tony Rayns and other contributions.